Hurry over to get this FrenchMay 3.7Qt Air Fryer , on sale for $59.99 Shipped with the coupon code: PEIKFNGD at checkout. I also clicked the 5% off coupon but it doesn't look like you will need to do that. -Great for traditional French fries and onion rings, Cooks steak, roasted potatoes, vegetables and more. No oil smell, no splatter, no mess. This air fryer is perfect for frying, baking, grilling and roasting with little to no oil. 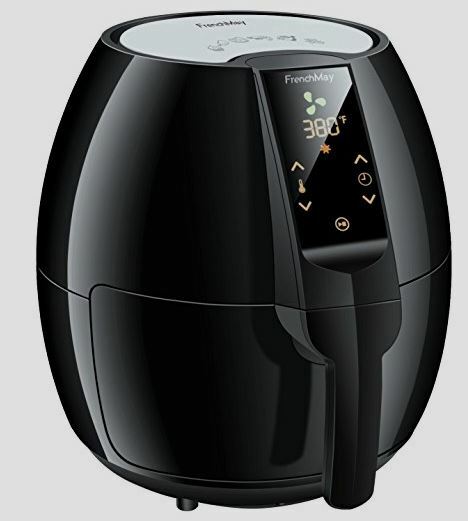 -FrenchMay Air Fryer features Dynamic AirFlow Technology, the leading Air frying technology rapidly circulates hot air and provides uniform cooking. Rapid hot air circulation cooking system combine the fast and precise of air flow to make your French Fries crispy and looks great. -Digital temperature control up to 400°F, 60-minute timer with auto shut-off. 7 presets references, fries/chips, meat, shrimp, cake, chicken, steak, and fish. Versatile for most of your favorite dishes. Big3.7 Qt. capacity, feeds up to a family of 4. -Easy-to-clean food Fry basket and basket holder Base, built-inCool-touch housing and handle. Removable parts are dishwasher safe and easy to clean. The Inner Parts are FDA Certificated Safe and Free of PFOAs.